Greetings! This is a scheduled post so I won't be able to reply quickly (not that I ever really do). So if you have any questions, I'll try to get back to you as soon as I'm back on a computer! Here's some fun nail art for you today. I wanted something loud and bright with some cool patterns. 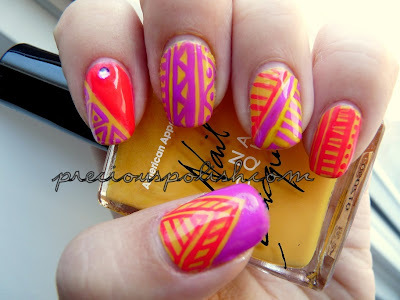 This is what I came up with, a neon tribal mix. I like it a lot, it's very fun and reminiscent of summer. I painted all of the nails with American Apparel Manila and then went crazy with Art Club striping polishes in Neon Yellow, Neon Violet and MOD Pink. This really is a fun mani! I love the colors you used! I would defo wear it, I love the colours, so summery! PS. I finally tried your Fishtail design. I failed so badly that I need to practice a bit more before I put it on my blog! LOL!! I love the design on your index finger! I would totally do that on every finger for a manicure. I love it! So bright and pretty! Thanks, Lizzie! I'm definitely going to try a full mani with the index design too! Do you have interactions ? lOve ! Do you have instructions on this ? Love ! Thank you! There are no real instructions for this. I just started with all of my nails painted yellow. Then I took striping polishes and started the design. For the index and pinky I paint vertical lines first, then fill out the spaces in between with other designs. For the thumb I started with the bottom triangles and worked my way up.